Take 42% off the entire book. Just enter code ssford into the discount code box at checkout at manning.com. 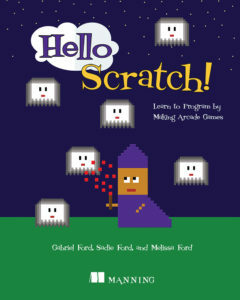 Hello Scratch! 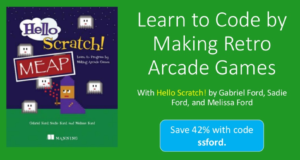 guides young readers through five exciting games to help them take their first steps in programming. They’ll experiment with key ideas about how a computer program works and enjoy the satisfaction of immediate success. These carefully designed projects give readers plenty of room to explore by imagining, tinkering, and personalizing as they learn. Find out more in the slide deck below.